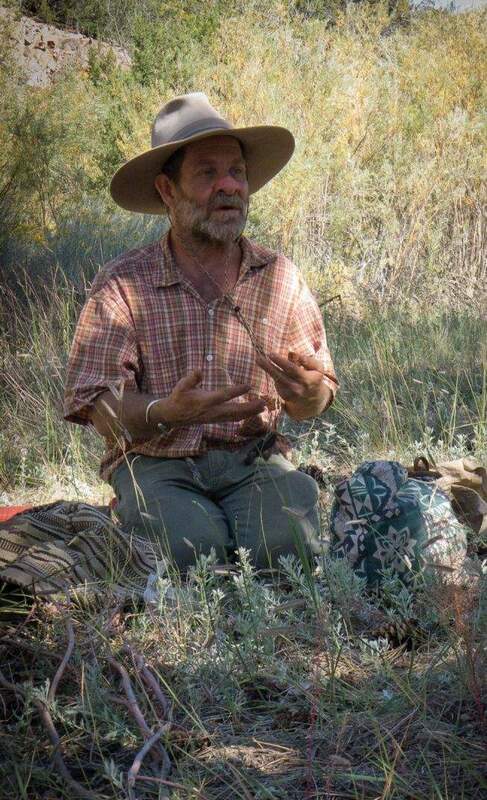 Doug Simons leads a field session about edible and medicinal plants near Santa Fe. Simons will present a workshop and sweat lodge June 29 through July 1in the mountains near Durango. Is it possible to live in a recreational paradise such as Southwest Colorado, yet lack a connection with nature? How many Durangoans have an encyclopedic knowledge of Phils World or Test Tracks but know little of the plant life that teems between the trails? My own efforts to identify trees and flowers beyond icons such as ponderosa and columbine tend to fail, and my desire to supplement dull backpacking rations with berries and leaves is held back by a fear of picking something delicious but deadly. To combat my ignorance, I signed up for an Edible and Medicinal Plants weekend in Santa Fe. A similar workshop will take place near Durango next week. These events are led by Doug Simons, an expert in wild foods, herbal medicine and the art of living outside with minimal technology. During 20 years spent exploring the wilderness of the Southwest United States and Mexico, this contemporary hunter-gatherer spent a decade eating solely foraged foods and made fire only with a bow-drill. During this decade, Simons relied on his two trusty burros for transportation and rode in a car just once, to travel to Mexicos remote Copper Canyon, where he spent months with the reclusive Tarahumara people. Ive led a pretty boring life, Simons quips. Brought up in Kremmling, he knew early on that he did not want to be the mechanic that his father wanted him to become. In his teens, he began what he describes as an apprenticeship to the plants and since then has treated hundreds of people with herbal medicine. During his long training, Simons studied with traditional healers in the Lakota and Navajo nations. In person, Simons is much more approachable than his intimidating résumé would suggest. He begins the workshop by asking participants what they want to learn, and when I shared my concerns about poisonous plants, he pointed out how few of them exist. Nature is not malevolent, once you get to know her, he reassured the group. Simons offers a refreshing contrast to the suffering and showmanship of TV shows such as Man vs. Wild and Survivorman. Living comfortably with nature and appreciating her gifts is the theme of the workshop. In addition to sharing numerous sources of tasty and nutritious greens, nuts and tubers, he demonstrates his remedios for conditions as varied as toothache, migraine, stomach upset, diabetes, sunburn and snake bite  all treatments passed down by oral tradition for generations and employed by Simons himself during travels far from modern medical care. As an added bonus, a morning is spent creating traditional woven baskets from cattails. This is far from being just a plant-identification class, although we did get to know dozens of plants, from the familiar  there are scores of uses for piñon pine and prickly pear  to rare shamanic plants that Simons introduces in reverent tones. Simons passes on his knowledge thoughtfully, with respect for the native wisdom he has inherited and an eye toward conservation. He insists that before collecting a plant, participants build a relationship with it  a process he calls courtship  so that they understand how and when to harvest without affecting the plants chance of survival. Simons believes that the way we behave toward individual plants has global implications and that we no longer can afford to see plants simply as objects for our use. Richard Malcolm is an outdoor educator, writer and photographer based in Mancos. Email him at mountainmalcolm@gmail.com. Cost: $290 for 3 days or $99 per day. Single-day participation is welcome. Free Workshop: Plants for your Medicine Bundle at Durango Natural Foods from 6 to 8 p.m. June 28. For more information: Call Deb Buck at (970) 946-7223, or visit www.chanchka.com.